My grandpa Gus was full of jokes — in particular, corny jokes, dirty jokes, and Ole and Lena jokes (especially the dirty ones). Any place he could fit a joke, he’d squeeze it right in. A native-born Swede, my grandpa Gus had Swedish knick-knacks throughout the house he’d built in Minnesota. The one I remember best hung above his toilet. I don’t know what happened to it after he died. I wish I did. Thanks to the magical insanity that is the internet, I just found it. (Well, it’s close. His was red, not blue.) As it turns out, it, too, is a joke. 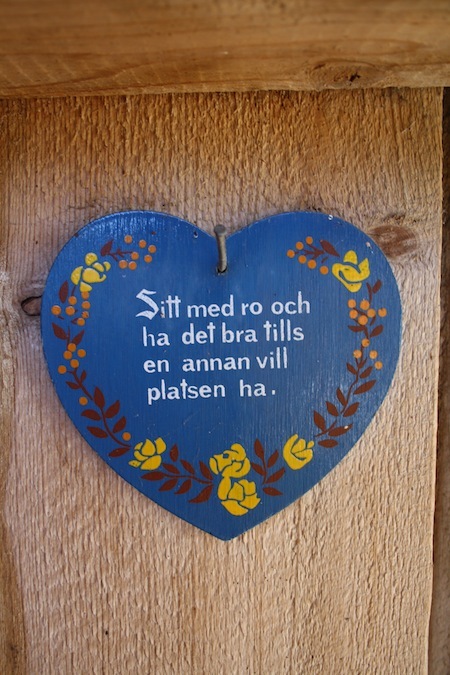 All the time that my grandpa was still alive and my cousins and I were weirdly obsessed with the saying on the plaque (we even used it as a secret password at one time — the whole damn thing), we never once asked him to translate it for us. So what does it mean? Translated by Google, something like, “Sit calmly and be good until another wants the place.” So basically, “You can sit on the toilet till someone else needs it, and do have a nice time pooping.” Thanks, grandpa, and yes, I’ll give you a solid guffaw for that one. For reasons I fail to understand, I think of that plaque often. I’ve never once known how to pronounce it correctly, but I can still say or spell all the words at a moment’s notice. My grandpa was born in Sweden as Gustav Wilhelm Johannson. When he immigrated to the US in 1926 at the age of 11, he willfully changed his name to Gus William Johnson. Though he was an American through and through, he — and apparently his toilet — embraced his Swedish roots throughout his life. So here’s to grandpa Gus, an eternally smiling Swede who could find places for jokes almost anywhere. Ole and Lena are sitting at their dining room table, listening to the radio and watching it snow out. All of a sudden there is a big message on the radio, "There is a snow emergency, please park your car on the odd side of the street." So Ole puts on his clothes and goes out to move his car. The next day the same thing, another snow emergency and the radio says, "Please park your car on the even side of the street." So Ole goes and parks his car on the even side of the street. A few days later there's a really bad snow storm and the radio says, "There's been a snow emergency please move your car to the ..." and the radio goes out. And Lena says to Ole, "Oh, forget it. Just leave your car in the garage this time."